As you enter the store there is a picture of Jack Cohen and an explanation of his story, and the foundation of Tesco. 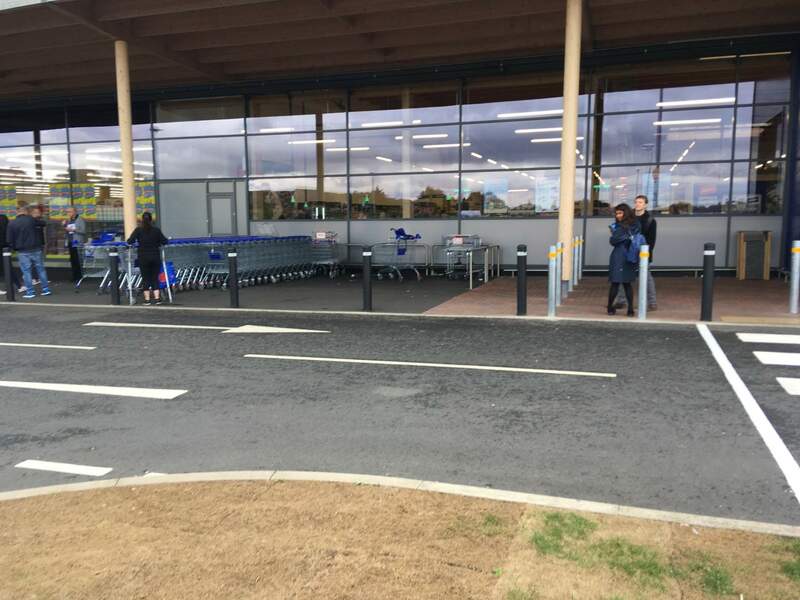 Chatteris – a smallish Fenland town – is not used to finding itself splashed over the national press, but such has been the case in recent weeks in the wake of the announcement it was to be the site of the first of Tesco’s new discount retail venture – Jack’s. Flashback to January 2015 when Tesco announced that the much-anticipated superstore, which was due to open in the town would instead be mothballed. The town’s inhabitants were hugely – and vocally – disappointed. When this was followed by the closure of the Co-op superstore in February of the same year, the only options for would-be customers looking for more than the basics was to travel to nearby Ely or March. It wasn’t until a year later – 2016 – that Aldi came to the rescue, opening a large store in the former Co-op store on the outskirts of the town. It remained the only real local shopping option. Until now. GlobalData consumer analyst Fiona Dyer paid a visit to the new store to check out the lie of the land. 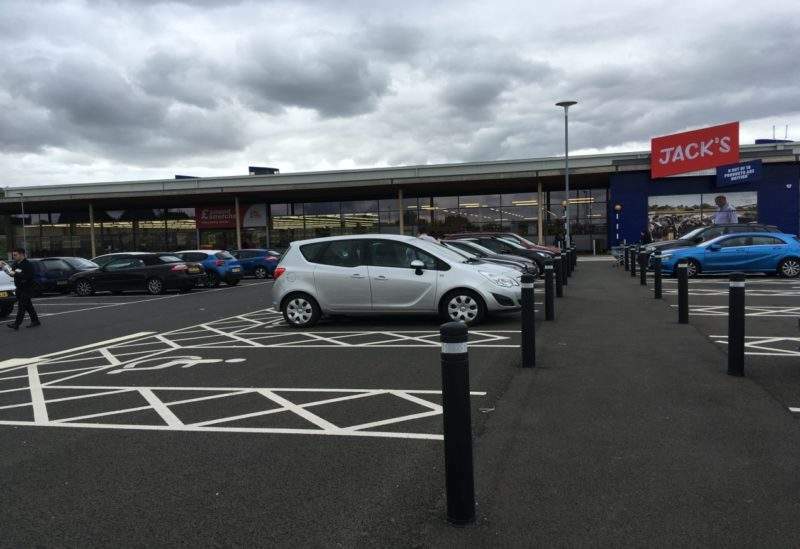 Interestingly, overhearing a discussion in the car park at Jack’s, it may well be that Tesco has to overcome a barrier it may not have considered – that of the hearts and minds of Chatteris residents. There is still a feeling of betrayal over Tesco’s decision not to open the planned superstore. The year spent without a supermarket is still very much in the minds of local potential consumers and they see no reason to abandon Aldi and migrate wholesale to Jack’s just because it is there. The shop itself is much smaller than you expect from an out of town former superstore. Indeed since February more than half of the original building has been taken over by Poundstretcher – possibly one of the largest I have ever seen. Possibly poignantly, when it opened, local newspaper The Cambs Times quoted the first visitors as noting that it “will make shopping a lot better for a lot of people – it saves going to Tesco”. The customer is presented on arrival at the car park with a giant picture of a rural scene with the promise that 80% of the food sold instore was British. It seems to work – a customer in the next car commented on the statistic favourably. As you enter the store there is a picture of Jack Cohen and an explanation of his story, and the foundation of Tesco. My impression from my first visit a week ago was that the store was nowhere near as brightly lit as the Tesco’s I am used to seeing. The ceiling is bare and single strips of light are spaced along exposed beams accompanied by small spots. There is an instore bakery immediately as you enter – with a fair selection of loaves and individual pastries which are cheaper than their Tesco equivalent – 40p for a croissant or a maple pecan pastry twist. A small selection of manufactured bread – mostly Jack’s branded, with only one Kingsmill and One Warburtons loaf. All the cakes were own label. The fruit and veg section takes up half an aisle (both sides) with a bit extra, all in plastic green crates, about half the usual space allocation – which is reflected in the range of produce available. The freezer section takes up half an aisle, again back to back, and chest height only – there is no overhead freezer space, which is highly unusual in modern outlets, and is one of the ways the store seems to be somewhat retro. The frozen selection is again small – just four types of party foods – but there is a whole section devoted to vegetarian and vegan options, so despite its back-to-the-past approach in some respects, Jacks’s is still keeping up to date with the key current consumer trends. Throughout the store the selection is very black and white – literally. The basic own label products are in clear or white packs and if you see a black pack you know it is a premium product. The nod to the past is apparent in the font used on many of the products. 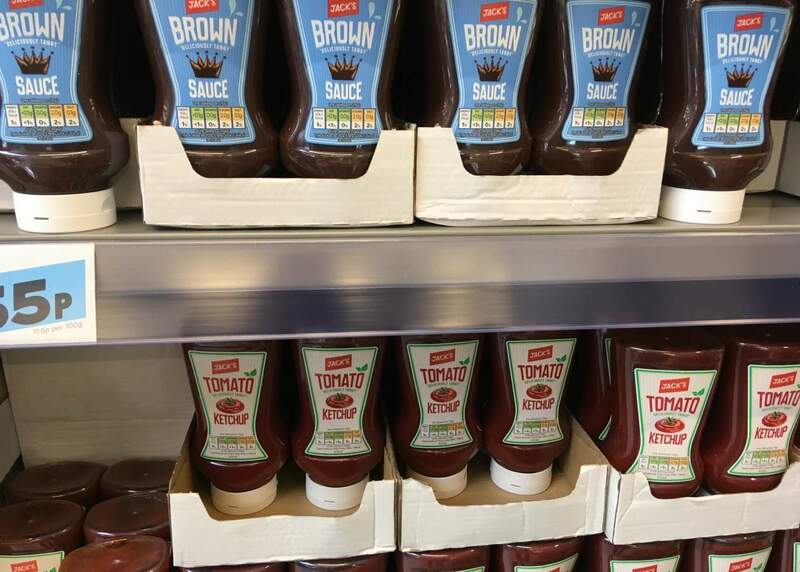 It seemed particularly evident on products such as the ketchup and brown sauce bottles pictured. All tea and coffee is branded Jack’s and there are only a few Cadbury sachets of drinking chocolate, a jar of Bournville and some Cafe Pods which are stuck on the top shelf. It is at this point I realise that the shelving units are smaller than usual throughout the store – being somewhat short, at no point did I have to hunt down a taller person to reach something from a top shelf. Again this is a key difference to the modern retail outlet. There were notable gaps on the shelves where some product were completely sold out – there was no organic milk for example. This may be due to the fact that the store is using a different system for stock control to that used by Tesco, or may simply be a glitch, only to be expected in a very newly opened store. Staff wear their own clothes but have a Jack’s ‘uniform’ of an apron. It may be to save money – there can’t be a huge variation in sizes to have to supply – but the visual impact again is to evoke memories of an old-fashioned grocery store. Perhaps it is a deliberate nod to the Jack Cohen’s retail history? The wine and spirits section is again small. The wines are roughly a pound cheaper than Tesco and generally stick to the basic chardonnay, sauvignon, pinotage type options. There are a few surprises mixed in amongst the bottles priced at £4.00 – notably the Chapeldown brut which seemed out of place priced at £20. There is a small section devoted to the sundry specials you expect from discounters rather than Tesco, and then the tills. There are just four of these – or five self-service options open. The carrier bags are located in shelves under the counter – just as they are in Aldi. The fact that there are so few tills suggests Jack’s isn’t expecting huge volumes of traffic through the store, something reinforced by the significantly smaller number of trolleys to be found outside. Given that Aldi remained the only real retail local option for nearly two years, it is looks likely that Jack’s and Aldi will be battling head on for customers. It will be fascinating to see how the struggle pans out. Aldi’s immediate response was to blanket bomb houses in surrounding villages and towns, offering a fairly hefty discount of £5 off every £25 spent over a four week period – evidently anxious to ensure that customers didn’t check out the new Jack’s at least for the next month. The Aldi store is significantly busier, as well as being much bigger and brighter – the strip lights in the covered ceiling are continuous. The fruit and vegetable section seems enormous after Jack’s, as does every other section of the store. There is so much more choice and there is really nothing much to choose between the stores on price. The bargain filled central aisles offer their usual temptation. One regular customer joked – only partly – that he had come in to buy milk and gone home with a guitar. In Jack’s, the cashiers chatted happily and revealed that a number of people they had served over the past week or so had travelled some distance to shop at the new store. Local people seem to be a bit more cautious and so far Aldi seems to be winning the battle for hearts and minds. Certainly Aldi is a more pleasant shopping experience overall and it is difficult to see what it would take for them to make the switch. However, a recent trip to the nearby town of March allows comparison with Jack’s to Lidl. Here Jack’s comes off significantly better, and it would be easy to see traffic migrating from the former to the latter, certainly if the stores are accurate representations of their usual offerings and appearance. The suggestion from the press is that a number of Tesco Metro stores will be converted to the Jack’s format, and looking at the Chatteris venture, this seems to be the right size. Ultimately the success of the venture has to rely on customers being convinced that the Jack’s brand is a good quality product, worth buying, because effectively they have very little choice otherwise. Only time will tell if the Tesco marketing team can pull that off.